The final day of the festival is here. We had some great music already and the weather has been outstanding. Every muscle in our body is aching and the beers are getting the best of us. So time to get some more and go out with a bang. One of the most hyped bands in the UK at the moment are the ones to wake us up. And do a good job. Catchy indie songs pass by at great speed. The band is playing with lots of determination and energy. The vibes are great and the way people are responding it's hard to believe this is the fourth day of the festival. But I'm not convinced the hype is completely justified. Singer Justin Young's voice isn't that great and it's not like you haven't heard it all before. Another one of the gigs I was really looking forward to. This Australian band were almost unknown a year ago and are now already playing at the bigger clubs. Their last album Innerspeaker is full of great psychedelic rock songs. But they are off to a hesitant start. The sound is awful in the beginning and the vocals are hard to hear the first couple of songs. The band clearly has to grow into it themselves and they sound better when the songs get a bit more firm and end up in great jams. In the end it isn't enough to really meet my expectations. Only a few weeks ago on the Pinkpop festival they didn't look so good. Their set didn't sound really balanced and they weren't able to light the fire. How different it is this time. Singer Ricky Wilson is racing around the stage and is climbing the mix table tent in the middle. The new songs sound a lot better and more convincing and of course the old songs make everyone dance and the whole field explodes. Another victory at Werchter for the Kaiser Chiefs. A few years ago I missed their performance at Rock Werchter and I wasn´t able to see them live last year either. Nick Cave's show a few years ago with The Bad Seeds on the same stage made a big impression on me so I made sure I was close this time. Right from the start he dives into it and he's moving around like a big rage. He pulls over his keyboard and later on even knocks over fellow musician Warren Ellis. It doesn't bother or stop him at all. He spits out his lyrics with great fire like he's being possessed by demons. The band is doing great backing him up with fiery guitar solos and solid aggressive grooves. It brings out the best in the loud and rough music. Of course this day is all about "The Maiden". It is easy to spot all the fans with the black t-shirts. And I'm sure they aren't disappointed. There's a lot of theater involved of course but the band looks fit and they sound convincing. They are exchanging smiles among each other and front man Bruce Dickinson is still full of power and energy. With so many albums to choose from it's not even possible to play all their hits but they are sure trying. Even Eddie comes along to waive at us. While the stage of Iron Maiden is being replaced with the one of the big closing act, DJ A-Trak is entertaining the crowd. 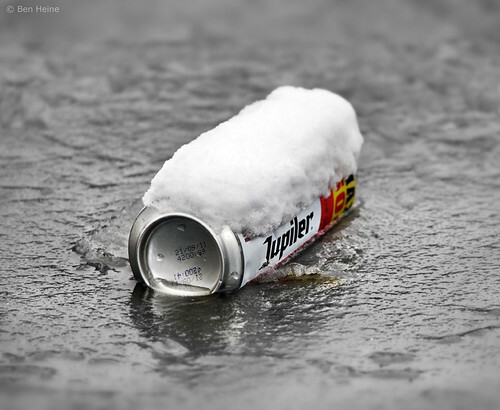 We were planning on bailing out at this point but it's Jupiler who took over so we decide to try out are dancing shoes. And fair is fair A-Trak is doing pretty fine. Which is not the case for the big closing act. There's a lot of show and Fergie's skirt is nice and short and she's looking yummy. But this is a big anti-climax. The songs are lame, everyone is using auto-tune and the raps are embarrassing. In the middle part they let a laptop play some golden oldies on a beat (you can't call that a dj set) which is even the best part of the show. So we drank more beers to forget. That only worked partially. But this year we had a great time again. Before the festival I heard lots of complaining about the line-up but it proved to be full of great bands. Maybe they should have replaced some of the headliners with true quality bands but that's a minor detail. With the absence of traffic jams (only a bit on the way home), the great weather (just a bit of rain at the beginning), great music and cold beers it was close to the perfect festival.